The State Industrial Investment Corporation of Maharashtra (SIICOM) along with the Maharashtra Government and a leading financial institution will infuse Rs 350 crore for the reconstruction of the under-moratorium United Western Bank (UWB), SIICOM Chairman R.M. Prem Kumar said here today. The merger of IBP Co Limited with its parent company Indian Oil Corporation (IOC) will be completed during the current financial year, its Managing Director V.C. Agarwal said. The government has mooted a proposal to merge dearness allowance paid to public sector employees with their basic salary, but it will have to wait till the appointment of a committee to review pay scales. The government has got overwhelming response from domestic and foreign companies for the sixth round of New Exploration Licensing Policy (NELP), and the bids would be opened on September 15. Doing business is not so easy in India as the country is way down at the 134th position in a list of 174 countries, ranked by the International Finance Corporation (IFC) on various parameters of business environment. Idea cellular today made entry into the hill state as the sixth operator with the launch of its services in six cities. Cellular company Aircel, which launched services in Kashmir valley and Jammu division, said it would cover over 100 towns in the state. Strong foreign fund flows in the market has catapulted the Indian currency to a high of Rs 46.15/16 against dollar, as it closed 13 paise up compared to the previous closing of Rs 46.28 per dollar, a money market trader said today. Intel, the world’s largest chip-maker today announced its plans to lay off 10,500 employees worldwide by the middle of next year, including a significant number of the company’s 3,000-strong team in India. IT services firm Cognizant Technology Solutions (CTS) today announced it had acquired US managed infrastructure and professional services firm AimNet Solutions Inc for an undisclosed sum. Jet Airways today became the first Indian carrier to provide three direct services between Singapore and three metro cities with the launch of a new international flight linking the national Capital. The MRTPC has rejected a case against Indian pharma major Ranbaxy Laboratories relating to overpricing of its products. Infosys Technologies today announced the expansion of its capability at Brno in the Czech Republic. The company said a new 350-seat facility under development there would double the capacity of its existing facilities. Trade ministers of G-20 bloc of developing countries, including India, as well as rich nations like the US, EU and Japan will meet in Brazil this weekend to explore the possibilities of reviving the stalled WTO talks. Union Commerce and Industry Minister today called upon the industry for raising the growth rate of services export to at least 15 per cent in the current financial year, while hinting that construction sector would be soon included in the services sector. 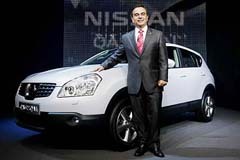 Japan's Nissan Motors is close to finalising its plans for India, which could see the company commit investments to the tune of around Rs 2,000 crore for having a presence across product segments. Kamla Dials and Devices Limited (KDDL) has signed a Rs 20-crore deal with Titan Industries to develop dials for the latter's international collection of watches, which will be launched later this year. UK's Conservative leader backs India-EU trade pact. The restructuring proposal has been approved by the SIICOM Board and now has been put before the UWB Board for its consideration, he said. The RBI has given time to UWB Board till tomorrow for submitting the bids of Rs 350 crore for the revival of the bank, which was put on moratorium by the apex bank on Saturday. Meanwhile, the state-owned Bank of Maharashtra said today that it would submit an expression of interest (EoI) for the takeover of UWB. A clutch of banks, including India's second-largest lender ICICI Bank, Canara Bank, Allahabad Bank and Andhra Bank, besides Saraswat Co-operative Bank, are bidding for UWB. Earlier, the Maharashtra Government had asked SIICOM to bail out the UWB. SIICOM holds a 10 per cent equity stake in the UWB. Meanwhile, the UWB Board is finalising its rehabilitation plan to be submitted to the RBI tomorrow. "Our package will include issues such as capital infusion and restructuring of the management," a UWB source said here today. "Our primary objective now is to maintain the independent identity of the UWB and the Government of Maharashtra is also supporting us in this effort," he said. Maintaining that the independent identity of the bank will benefit all concerned, he said this would help ensure the future of more than 3,000 employees of the bank and small depositors. Pointing out that only around Rs 25 crore had been withdrawn from the 230 branches of the bank since the RBI imposed the moratorium, the source said the depositors of the bank were for maintaining the independent identity of the bank. Mr Agarwal told shareholders at the company’s 98th annual general meeting here that the merger process was in the final stage, adding that it would completed in 2006-07. He said the merger would benefit both IBP and IOC by consolidating the petroleum marketing business for enhanced efficiency. The scheme of amalgamation would be 110 equity shares of IOC for 100 IBP shares. Post-merger, the IBP brand would be retained, adding that a decision would be taken on whether to continue with it in future. During the year, the company would open 250 retail outlets at a cost of Rs 110 crore. The Department of Public Enterprises has moved a note for consideration by the Union Cabinet, which is likely to discuss the issue next week, official sources said. However, the merger of DA with basic salary would be implemented only in those PSUs which have the capacity to pay the enhanced amount. The Centre would not provide any additional funds for this purpose. The government action comes in the backdrop of a decision by employees of some of the biggest PSUs such as NTPC Ltd, SAIL, Coal India Ltd and the NHPC to go on strike on September 12 if their demands, which includes DA merger, were not met. Another proposal to constitute a commission to increase the pay scales of PSU employees has also been sent to the Prime Minister’s Office for approval, the sources said. “We have sold so far data worth Rs 72 crore to the companies interested in bidding for the NELP VI as compared to data sold worth Rs 20 crore during the fifth round of bidding. More companies are expected to submit bids on last day of bidding, i.e on September15. The bids will be opened on the same day to grant licences for exploration in the blocks,” said a senior official in the Petroleum Ministry today. Encouraged by the response of the private and public sector companies, he said, Petroleum Minister has instructed the Director-General Hydrocarbons, Mr V.K. Sibal, to make special arrangements for receiving and opening of the bids in a transparent manner. Fifty-five blocks are on offer for bidding in the NELP VI licensing round. The official said since the government has allowed 100 per cent FDI in the oil and gas exploration sector, global oil majors are showing keen interest. Further discovery of oil and gas in Rajasthan, Krishna-Godavari (KG) basin has further encouraged these companies to invest in the exploration sector. The successful bidders would be required to enter into a production- sharing contract (PSC), which will be negotiated based on the model production-sharing contract (MPSC). To attract investment in the exploration, the government is offering income tax holiday and other tax incentives besides freedom to the contractor for marketing of oil and gas in the domestic market. According to sources, among others, E&P companies such as Russia-based Zarubezhneft (a subsidiary of Gazprom), Woodside, Dragon Oil Pty, Orient Petroleum, Oil Search, Crescent Petroleum, and Dalma Energy have shown interest in the exploration. Public sector oil and gas companies like ONGC, OIL, IOC, HPCL, GAIL, besides private companies Reliance, Cairn, Essar are also likely to bid for this round, the official added. The challenges of starting a business in India are far many with entrepreneurs expected to go through 11 steps over 35 days on an average to launch a business at a cost equal to 73.7 per cent of the gross per capita income, according to a finding contained in a report on “Doing Business, 2007” by the IFC, the private sector arm of the World Bank. It takes 270 steps and 20 days to complete the process of complying with licensing and permit requirements for ongoing operations in India. Even among eight South Asian countries, India ranks sixth in the category of “ease of doing business” with only Bhutan and Afghanistan occupying positions behind it, according to the report. The only solace that India could get in the ranking is that its position is somewhat improved from the 2006 index when it was positioned at the 138th position. On 10 parameters, India is ranked at the 88th position when it comes to starting a business, 155th in terms of dealing with licence, 112th on the parameters of employing workers, 10th on the indicator of registering property, 65th in getting credit, 33rd in protecting investors, 158th in paying taxes, 139th in trading across borders, 173rd in enforcing contracts and 133rd in closing a business. Entrepreneurs in India must make 59 payments for taxes, spend 264 hours and pay 81.06 per cent of gross profit in taxes, according to the report. It takes 56 steps and 1,420 days to enforce contracts in India and the cost of enforcing contracts is 35.69 per cent of debt. The “Difficulty in hiring” index for India is 33 compared to 41.8 for the whole region and just two for all economies. The “Difficulty in firing” index is 70 in India compared to 37.5 in the region and two in the world. The process required to resolve bankruptcies takes 10 years and costs 9 per cent of the estate value. The recovery rate, expressed in terms of how many cents on the dollar claimants recover from the insolvent firm, is 12.97. The Governor of Himachal Pradesh, Mr V.S. Kokje, launched the services covering Shimla, Mandi, Solan, Baddi, Kulu and Sundernagar in the first phase. Bilaspur, Hamirpur, Manali, Kufri, Chail, Kasauli, Parwanoo and Nalagarh will be covered in the second phase. The company's President and CEO Vikram Mehami said Himachal was the ninth circle to be covered and the company had applied for licences for 12 more circles, including Punjab and Haryana. The total investment in two phases would come to Rs 200 crore and the company would install 110 towers to provide seamless connectivity. He said Idea had 90 lakh subscribers in the country and was hopeful of expanding the base in Himachal Pradesh. The company unfolded the 60 paise plan with 120 seconds pulse for calls from Idea to Idea, 60 seconds pulse for other mobile networks and landline phones and 30 seconds pulse for STD. The charges for local calls and SMS would also be 60 paise. Strong foreign fund flows in the market has catapulted the Indian currency to a high of Rs 46.15/16 against dollar, as it closed 13 paise up compared to the previous closing of Rs 46.28 per dollar, a money market trader said today. Earlier, the rupee opened at Rs 46.30/32 per dollar and in the mid-morning session traded at Rs 46.24/25. The huge lay-off plan comes amid a sharp 57 per cent plunge in Intel’s second-quarter net profit and concerns over a market share loss to rival chipmaker Advanced Micro Devices (AMD). Announcing the plans, the company said the restructuring plan expected to generate savings in costs and operating expenses of approximately $2 billion in 2007. In 2008, the company expects savings from this restructuring to grow to approximately $3 billion annually. “These actions, while difficult, are essential to Intel becoming a more agile and efficient company, not just for this year or the next, but for years to come,” said Mr Paul Otellini Intel President and Chief Executive Officer, yesterday. Intel has said that its staff strength would decline to 95,000 by the end of this year as a result of workforce reductions, attrition and previously announced layoffs. By mid-2007, the Intel workforce would drop to about 92,000 employees, 10,500 fewer than the company’s employee population at the end of the second quarter of 2006. IT services firm Cognizant Technology Solutions (CTS) today announced it had acquired US managed infrastructure and professional services firm AimNet Solutions Inc for an undisclosed sum. The Network Operations Centre (NOC) of the US firm would complement Cognizant’s NOC in Bangalore to service customers and enable it to do higher-end work in infrastructure consulting in network architecture, planning, design and infrastructure security solutions. Jet Airways today became the first Indian carrier to provide three direct services between Singapore and three metro cities with the launch of a new international flight linking the national Capital. It also has direct flights to Singapore from Chennai and Mumbai. The daily service will depart from Delhi at 8.35 a.m. and reach Singapore at 4.50 p.m. local time. The return flight will depart from Singapore at 11 p.m. and arrive in Delhi at 2.15 a.m. the next day. "The mere allegation of manipulation of prices would not be sufficient to establish a restrictive trade practice," said MRTPC Acting Chairman M M K Sardana, rejecting a suit by its investigating arm Director-General of Investigation and Registration. The Commission said all evidences produced against the pharma giant were either "vague or were based on mere personal impression". "The G-20 meeting would be a stock-taking exercise meant to reaffirm the group's stand on key issues at multilateral talks," a senior government official said. Commerce Minister Kamal Nath would lead the Indian delegation at the meeting, which would be held on September 9 and 10 in Rio de Janeirio. The official said US Trade Representative Susan Schwab, EU Trade Commissioner Peter Mandelson and WTO Director- General Pascal Lamy will also be present during the meet. The official said any progress in WTO talks hinges on whether the US was ready to submit a revised offer for reducing domestic farm subsidies and scaling down its ambitions for market access in developing nations. The G-20 conclave is the first meeting of the group since the collapse of the Doha round of talks in July this year. Underlining the importance of the Services Export Promotion Council, Mr Nath said, "This is a major step forward for boosting exports from the services sector by identifying new areas. The Council and the CII have to play a major role in deepening and widening the scope of services exports." The growth in the services sector, that has seen it go up to 50 per cent of the GDP, is driven by domestic demand, said the Minister. Whether it is entertainment, education or the media, home-grown companies have led the growth manufacturing and services have become the economic backbone of the country. The government will do all it can to facilitate the future growth of the sector. He said India needed to create more jobs to absorb 37 million people by 2012. For this, universities and institutes of higher education need to be expanded to create more knowledge workers. Special Secretary in the Department of Commerce, Mr G K Pillai, said Indians spent $4 billion studying abroad. In order to make quality higher education attractive in India, the government should facilitate the setting up of foreign institutes and universities in the country. Chairman of CII's Services Council, Mr S Ramadorai, said services contributed just 10 per cent to the country's exports currently. "The company is in the process of working out plans for India and these will be shortly finalised," industry sources said. KDDL has come up with diamond and zircon-studded dials, complex dials with Indian motifs like dials with lace work and enamel work. Mr Yasho Saboo, Managing Director of KDDL, said today that the company had signed a contract for 20 per cent higher quantity with Titan, which represents 70 per cent of the total requirement of Titan Industries. Mr Saboo said: "KDDL is also working to create new products in Sonata, Fastrack, Raga, Edge, Nebula and other brands. Earlier, diamond and stones for the dials were restricted only in the Nebula range of watches. But now, we are creating these dials for the Raga range, which will shortly hit the market," he added. Chennai-based software company Sanra Software Ltd has decided to acquire Pixalaya Studios Pvt Ltd and Drushya Entertainment Broadcast Streams Ltd for Rs 21 crore. The Board yesterday approved the proposal to acquire Pixalaya for Rs 12 crore, by issuing 80 lakh equity shares of the company on a preferential basis to the shareholders of Pixalaya. The shares of Sanra Software would be issued at a price of Rs 15 (including premium of Rs 5 per share) to the shareholders in lieu of their holdings in Pixalaya. The decision to acquire Drushya for Rs 9 crore was also approved by the Board.